Amazingly, we've now completed seven marathons in seven days. Just incredible! Yesterday, day 6, I had a truly fantastic run - I felt great, didn't have any pain, and I was in a great mood. A totally different experience to the miserable day before, and I finished the marathon in 4:17 - a time that I would never have even considered achieving before starting the 10in10. I was over the moon when I crossed the line and rambled on at length for Martin and his camera - I don't think I came across as the sanest person around ;) But I loved it, and will remember that run. Today was a bit of a different matter. 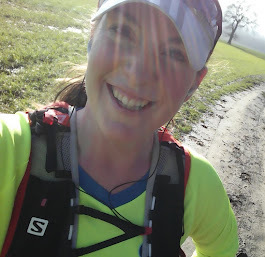 The seventh marathon of the 10in10, and my 30th marathon in total, and we were blessed with gorgeous sunny weather. Wouldn't want to complain about the weather all the time (I know it might come across that way)...but it might have been a bit too warm! 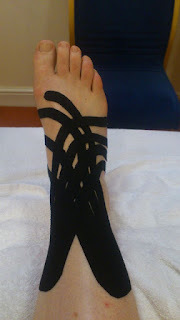 I'm just back from physio now and have had a rather striking bit of taping done on my ankle which will hopefully help overnight, and I'll get it taped again in the morning, when we will all take on number eight!! Well done, Naomi, fantastic running. You're incredible !